Nest just exited the stage at their scheduled press event for today, announcing all sorts of new stuff that Nest fans will most certainly enjoy. They refreshed their entire product line, in case you were wondering. That means they showed off the all new Nest Cam, a 2nd generation Nest Protect, new software for the Thermostat, and a brand new app for Android and iOS. I’ll try and recap the big stuff, but I highly recommend you dive into the press release below, because there is more stuff in there than I can even talk about without spending my entire day on Nest. First, we get the Nest Cam, which you know a lot about, thanks to us. It’s a slimmed down, upgraded Dropcam that also has a magnetic base with tripod attachment hole, full 1080p video, improved motion alerts and night vision. With Nest Aware, Cam owners can subscribe for a monthly fee to gain access to video history, alert summaries, clips & timelapses, special activity zone configuration, and advanced motion sensing. With the new Nest Protect (2nd gen), we get a new design that is 11 percent smaller than the original, split-spectrum sensor, 10-year product lifetime, ability to silence via application, safety checkup via app, automatic sound check of the Protect’s horn once per month, and easier installation. Hopefully, they fixed all of the false alarm issues they had with the original. The new Nest Thermostat 4.5 software will start rolling out to customers today, with new features like safety temperature alerts (if your home gets too hot or cold), alerts from your Nest Protects, an emergency shutoff, and improved support for multi-zone homes. As for the new Nest 5.0 Android and iOS app, you get a new home screen and UI that shows your Thermostat, Protects, and Dropcams or Nest Cams. Yes, cameras in the Nest app! The Nest Cam is available today for $199, along with the Nest Protect (2nd gen) for $99. The Android app should be available today on Google Play. To dive deeper into the products and the features I just mentioned, hit up the press release below. 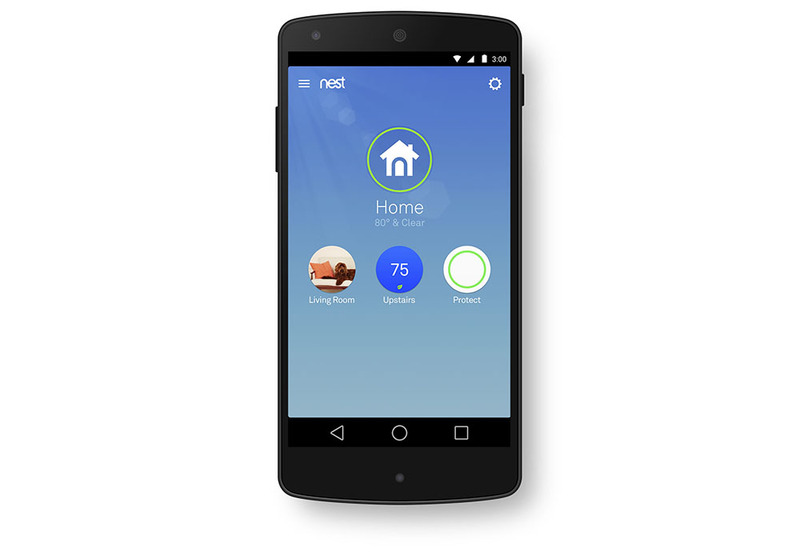 Palo Alto, California — June 17, 2015 — Nest Labs, Inc. ( www.nest.com ), architect of the thoughtful home, today announced sweeping refreshes and redesigns across the company’s entire product portfolio with the introduction of Nest Cam, the second generation Nest Protect, new features for the Nest Learning Thermostat, and a brand new app. 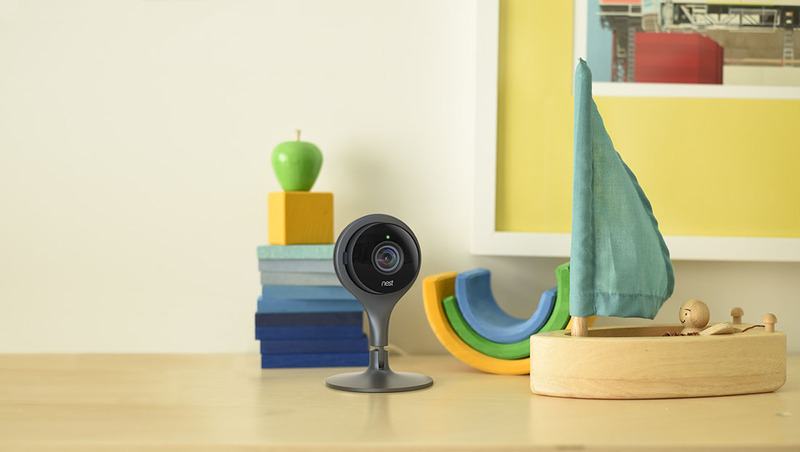 Nest Cam – With full high-definition (1080p) video quality, a versatile stand, and improved motion alerts and night vision, the new Nest Cam allows people to keep an eye on what they care about from anywhere. And beginning next month, Nest Cam will be available in Europe. Nest Protect – The second generation Nest Protect smoke and carbon monoxide (CO) alarm is the first residential alarm to offer a custom, Split-Spectrum Sensor that uses two wavelengths of light to look for different types of fires. Also, Nest Protect alarms can now be silenced from your phone. Nest Learning Thermostat – The best-selling Nest Learning Thermostat is getting even better, now notifying customers when temperatures drop to help avoid frozen pipes and adding new integrations with other Nest products. Nest app 5.0 – The redesigned Nest app 5.0 brings together all three Nest products, across multiple platforms, for the first time, making it easier to access and control Nest products. With live video streaming to a phone or computer, Nest Cam gives people peace of mind and the ability to stay connected to the things they care about. The all-new Nest Cam builds on the Dropcam features customers love, adding better video quality and a new design to make it even easier to keep an eye on your home. Nest Cam will be available for the first time in Europe, specifically in Belgium, France, Ireland, Netherlands and the U.K.
New design – The new stand’s magnetic base can stick to metal, be mounted to the wall or screwed onto a universal tripod. It can twist around, bend at an angle, or be mounted upside down. The stand incorporates a rare-earth magnet and ¼ inch, 20-screw mount, so you can securely place it in even more locations. Its body design provides three degrees of freedom so customers can capture the view they want. Video quality – Nest Cam delivers crisp 1080p HD over Wi-Fi so customers can see the finest details across the room. Secure streaming – Stream and store video content with a unique 2048-bit RSA key and securely transmit using a 128-bit SSL connection. Improved Night Vision – Eight high-powered infrared LEDs and new algorithms improve Night Vision and motion detection. Other home cameras give you a spotlight view at night, but Nest Cam lets you see the entire room. And because Nest Cam’s sensors know the difference between a flashlight and sunlight, Night Vision won’t get confused and switch to day mode every time a bright light passes in front of the camera. That can be hugely helpful if an intruder turns on a flash light, or if headlights flash across your window. Video History – Scroll through 10 or 30 days of content depending on your subscription choice so you have extra time to see what happened and save the stuff you want to remember. Alert Summary – If something happens, you don’t have to dig through hours of video to find it. Nest Aware with Video History highlights the moments when there is motion or sound and shows you what happened. Clips & Timelapses – Make, save and share up to three hours of clips. Activity Zones – Create custom Activity Zones around areas of interest – such as a door – so you can be alerted of any activity in a specific area. Advanced motion sensing – Nest Cam uses the power of the cloud to provide more accurate alerts and detect areas where common false alarms occur, like ceilings. Unbox Therapy – Lewis Hilsenteger has built a subscriber base of more than two million by sharing the unboxing process of a wide range of consumer electronics products. Lew will use Nest Cam to set up a live stream of his production studio. Devin Supertramp – Devin Graham is an American videographer who produces adventure and extreme sports videos. His channel has more than three million subscribers. Devin will use Nest Cam to give his viewers a live look at the preparation that goes into his amazing stunts. iJustine – Justine Ezarik is a techie, gamer, vlogger and a top personality on YouTube with more than three million subscribers across her channels. Justine plans to use Nest Cam as a way to live stream some of her special events. In addition, Nest has enabled some of the most popular camera feeds to stream directly to Nest’s YouTube channel (www.youtube.com/nest) so people can see live video of everything from puppies to scenic landscapes – all in one place. According to the National Fire Protection Agency (NFPA), 60 percent of fire deaths in the U.S. happen when there’s no smoke alarm or the smoke alarm failed to operate. The second generation Nest Protect has new features to help people know the alarm is working and running safely, and it now has up to a ten- year product lifetime. Like the first generation Nest Protect, it does more than just sound an alarm. It speaks to you, telling you what and where the problem is. New design – The second generation Nest Protect is 11 percent smaller and sits more flush against the ceiling or wall. It has a stainless steel screen with tiny hexagonal holes designed to let in smoke for assessment while keeping everything else out. And the light ring now shines even brighter for a better Pathlight. Split-Spectrum Sensor – Inside the new smoke chamber, Nest Protect uses two wavelengths of light to look for both fast- and slow-burning fires. App Silence – Nest Protect warns you of danger, but if everything’s under control, you might not need that sound anymore. Now you can hush false alarms from your phone or tablet using the new Nest app. Up to 10-year product lifetime – Nest Protect’s updated sensors provide customers with a new, longer product lifetime of up to 10 years before the device needs to be replaced. Safety Checkup – The NFPA recommends you test your alarms once a month. Now, you can test the sensors, power, Wi-Fi connection, horn and speaker on all your alarms, right from your phone. Sound Check – Once per month, Nest Protect automatically tests the speaker and horn – quietly and quickly – using a built-in microphone. Easier installation – A redesigned backplate helps get Nest Protect level when placing it on your ceiling or wall, and an easy-to-open battery door makes battery replacement easier than ever. Nest Protect also includes Bluetooth Low Energy (BLE) to improve pairing during setup. Whole Home Nightly Promise – Nightly Promise shows you Nest Protect’s sensors and batteries are working with a quick green glow after you turn off the lights, or a yellow glow if Nest Protect needs attention. Now, instead of only indicating the status level of the Nest Protect in the room you’re in, Nightly Promise will indicate the status of all Nest Protects throughout the home so you can sleep safe and sound. Just like a car alarm can reduce your car insurance premium, having a Nest Protect can reduce your home insurance premium. Building on the success of Nest’s energy partner program, Nest is partnering with forward-looking home insurance companies to help people stay safe while saving money on their insurance policies. Four out of five firefighters would trust Nest Protect to protect their homes, and insurance companies know that Nest Protect can keep families safe from smoke and carbon monoxide. They’re working with Nest to give eligible customers a Nest Protect for less – or even at no cost. Additionally, through Nest Safety Rewards, a participating Nest insurance partner may give you a discount on your annual premiums. These monthly reports do not include whether the alarm went off, and even if a customer’s Nest Protect temporarily loses power or Wi-Fi connectivity, it won’t impact the benefits Nest’s insurance partners offer through Safety Rewards. And of course, customers can opt out of Safety Rewards at any time from within the Nest app or by contacting their insurance company. American Family, a multi-line insurer based in Madison, Wisconsin that operates in 19 states, and Liberty Mutual Insurance, the third-largest property/casualty insurer in the U.S, are the first insurance partners to provide offers as part of Nest Safety Rewards. Customers can enroll with American Family in Minnesota starting today and with Liberty Mutual Insurance in Alabama, Illinois, Kentucky, Maine, Pennsylvania and Wisconsin starting this summer. Both American Family and Liberty Mutual Insurance are exploring plans to expand the program to additional markets. Visit www.nest.com/insurance-partners to sign up for Nest Safety Rewards or to learn more. The Nest Learning Thermostat is adding new features to both first and second generation products, and also has a new integration with Nest Protect to help keep Nest customers safer and more comfortable. Safety Temperature Alerts – Nest now sends a message to your phone if your home gets too hot or too cold. So you’ll get a notification if your pipes could freeze or a pet could overheat. When the temperature returns to normal, Nest will let you know. Nest Protect Emergency Alerts – If you have a Nest Protect at home, you can now see smoke and CO alerts right on your thermostat. The more places you see an alarm, the more chances you have of catching a problem early. Nest Protect Emergency Shutoff – Some heating systems can be a source of CO leaks. Others can make a fire worse by spreading smoke throughout your home. Now your Nest Thermostat and Nest Protect can work together to turn off your forced air heating/cooling system in a smoke or CO emergency. Improved multi-zone homes – Control up to 20 thermostats, per home, from within the app. The thermostats will work together to save energy and coordinate Auto-Away. For the first time you can control all of your Nest products from a single app. The fifth generation Nest app for your phone, tablet and computer has a new look and added features that make it easier to control all your Nest products, and your existing Dropcams. Customers can use the Nest app in any browser and on both Android or iOS devices (iOS 8.0+, Android 4.0+). Home Screen – Each Nest Thermostat, Nest Cam or Dropcam has its own spot, while all your Nest Protects roll up into one icon. You can also see live video previews of all your Nest Cams on the home screen so you can get a quick glance of different rooms. Nest Learning Thermostat – It’s now easier to get to and use popular thermostat functions like Energy History, Heat/Cool mode and schedule. Nest Protect – Provides access to Safety Checkup, which lets you test all your alarms from the app, and App Silence lets you hush false alarms from your phone. Nest app offers new enhanced features for phones, including zoom and enhance, which adjusts to give you a sharper view. Talk and Listen is now easier to use. Just hold down the icon and start talking, just like a walkie-talkie. If you have a subscription to Nest Aware with Video History: The Nest app provides a summary of captured events, making it easy to spot moments in your Video History when your camera sensed motion or sound. You can easily skip among events or jump 30 seconds at a time. Dropcam Pro and Dropcam HD can now be accessed from within the Nest app. If you have a Nest Cam and Nest Protect in the same room, you’ll see a camera button when you get a smoke or CO alert on your phone. Tap the button and you’ll immediately be taken to a live view of your home, so you can see what’s going on. Nest Cam will also record a clip of what happened, even if you don’t subscribe to Nest Aware with Video History. Nest Cam is available for purchase today with a suggested retail price of $199. It will begin shipping this month. Nest Aware with Video History can be purchased as a 10-day or 30-day subscription for $10 or $30 per month, respectively. Nest Protect is available for purchase today for a suggested retail price of $99. It will begin shipping next month. Nest app 5.0 is available now in the Google Play Store and iOS App Store. Nest Learning Thermostat software 4.5 will begin rolling out today and will take up to two weeks to reach all Nest customers. Nest Cam and the second generation Nest Protect are available for purchase now at www.nest.com, as well as from a range of retail partners, including Amazon, Best Buy, Google Play, The Home Depot, Lowe’s and Target in the U.S. The Nest Aware with Video History subscription is available exclusively at www.nest.com or through the Nest app. Nest Protect, Nest Cam and the Nest Aware with Video History subscription will also be available in Belgium, Canada, France, Ireland, Netherlands and the U.K. this summer. Finally, starting today, customers in markets where Google Fiber is available – Austin, Texas; Kansas City, Kansas; Kansas City, Missouri; and Provo, Utah – who sign up for Fiber can purchase up to three Nest Thermostats for $200 (regularly priced at $249) with installation included. Visit google.com/fiber/nest for more information. Nest’s mission is to create a home that’s thoughtful – one that takes care of itself and the people inside it. The company focuses on simple, beautiful and delightful hardware, software and services. The Nest Learning Thermostat™ and Nest Energy Services keep you comfortable and address home energy consumption. The Nest Protect: Smoke + Carbon Monoxide™ alarm helps keep you safe while Nest Cam™ keeps an eye on what matters most in your home. Nest products are sold in the U.S., U.K., Canada, France, Belgium, Ireland and the Netherlands and are installed in more than 190 countries. The Nest Learning Thermostat has helped save three billion kWh of energy to date. The Nest Developer Program, Works with Nest, makes it possible for Nest devices to interact with other products in your home to do even more. For more information, visit www.nest.com.